From time to time, a business will find it necessary to change locations. Moving a business is no different than moving a home in theory. You will have items in one place that need to be moved to another place. Simple right? Businesses typically have customers relying on uninterrupted service. You want to have as little impact as possible on the bottom line, so how do you accomplish this? By packing smart. Take an inventory of your business holdings. Look at your calendar to determine what materials you will require to maintain scheduled business. Sort your inventory into two groups essential and non-essential. If an item is essential, give it an expiry date (eg: Pack this 2 Days before moving day). Draw a floor plan for the new space. Make sure everyone knows where they will be working. Plan and draw out where each large item (desks, filing cabinets, photocopiers etc.) will go. Speak to service providers (such as electrical, waste collection, and Internet service providers) to ensure a smooth transition. Schedule the move as early as possible for a day that will impact your business the least. Give your clients plenty of warning about the move, and when it will happen. By sorting items into Essential and Non-Essential categories, you can stagger your packing to make moving day that much easier. It is possible in some situations to begin moving the smaller non-essential items before moving day. This will make your move faster, and easier, saving you both money and time. It is common for commercial moves to have larger items. Make sure your team of movers is aware of these items, and knows where they will be going once you reach your next space. Unlike some of the smaller items, these will all be moved on the same day, so having your floor plan drawn up is extremely useful. Hopefully, a few of these tips will help you to keep the impact of your commercial move at a minimum. Have a look at some of our other common packing tips for more help on safely packing away your possessions. There are a large number of apartment buildings in Victoria, and you might think that most of them are easy to move. You would be right, of course, but even the simplest apartment moves can become an extended chore when the right planning doesn’t take place. Some buildings have a designated loading zone. Some buildings rely on street parking. Whatever the case, make sure you have access to parking on the day of your move. Talk to your building manager before hand to make sure that your moving day does not conflict with any construction or large deliveries. If your parking is limited to the street, try to reserve a spot close to the most convenient entrance. Having a great view on the 15th floor is such a nice perk, until you need to get your giant sectional sofa to the lobby. Most apartment buildings in Victoria have 2 elevators, and will allow you to reserve one on moving day. Having your own elevator will save you a lot of time (and thus, money). If your building is limited to a single elevator, letting your building manager know at least a week in advance is considered good form. They can alert other tenants of the limited elevator service, and they might just provide a key for loading the elevator. Moving out of apartment number one is fairly simple, but make sure to organize all of the same things for moving in to apartment number two. Have a key ready for both the floor entrance and your apartment or suite. Have someone ready to welcome the movers. Have parking ready near the door, and have an elevator ready to go when they get there. When everything goes smoothly, you can save a lot of time on an apartment move. Less time moving means a cheap move over all. It makes you wonder why we tell people this stuff. Call us directly if you’re looking for a quote on your next apartment move. Estimates are always free. Anyone who has experienced a back injury can tell you, it’s worth avoiding. The Internet is full of tips and tricks for proper lifting techniques. Take it slow, bend at the knee, direct movement with your hips, and hold objects close to your body. This post isn’t meant to add to the noise, but I thought you might enjoy a little story about avoiding injury. A man who worked in employment insurance once told me about a logging company that wanted employees to move equipment around faster. Employees were getting injured, and it was costing the company money. So the company decided that they would hire a group of professional power lifters from the gym. These were men that picked up heavy things for fun! Why shouldn’t they do it for money? When the muscled men arrived for duty, the logging company showed them the equipment and material that needed moving. The response of the lifters was shocking. Each of them walked off the job. The logging company was asking too much. Lifting heavy awkward material and moving quickly would put the lifters backs at risk, and each lifter understood the importance of a healthy back better than the average worker. In the end, the company was forced to change their practices. Knowing the proper techniques for lifting can help us avoid injury, but if something is beyond our ability to lift, there is no shame in asking for help. Professional movers lift every day, but they also have dollies, skids, and blankets that make certain items much safer to move around. If something is beyond our capacity to move (yes, sometimes that happens), we can arrange for the proper help to get it done. Nothing is worth a back injury. Having your stuff packed properly can really help to make lifting less awkward. Take a look at some of our packing tips before the big day arrives. Things left in storage are usually “for another day”. When was the last time you looked at your things in the basement or attic? Storage space is extremely useful, but rarely the first thing on our mind. Regardless of how useful it is, storage is easy to forget about! Well here are 5 reasons to remember storage (especially as we enter a new spring season). Timing isn’t always perfect. Temporary housing is sometimes necessary when you move from one home to another. Staying with friends or relatives can help to bridge the gap, but most will not have room for all the household items. Dry container storage is an absolute lifesaver at times like this. Europe. Asia. Central America. Your favorite place. A place you have never seen before. All of these possibilities, and so much more potential. You have the date set, and your ticket purchased. Now where will you put all your stuff? That big backpack with the flag sewed proudly on the back probably isn’t large enough to fit everything on your journey. Store it cheaply, in a container, and come back whenever you’ve seen enough of the planet. Victoria has a significant number of great looking apartments. Stylish, affordable dwellings with plenty of light, they’re close to bus routes, and there’s a great little coffee shop just on the corner. The only problem? You guessed it… storage space. Not everyone can fit the things they own into a smaller living space, so they store their items seasonally. Spring is a good time to pack away those heavy winter clothes, and the ski’s can always come out next year. Pull out the golf clubs, the box of summer sandals, and the barbeque in preparation for summer. Upon the death of a family member, the handling of estate property is a delicate matter that deserves patience and respect. Containers can be rented until the matter of divided property can be resolved. Practical concerns are rarely the priority during such a difficult time, and there’s nothing wrong with that. Store it away for another time. Homes are not the only spaces that run out of room. Businesses need to adjust to the priorities of the day, and when space runs out, new space must be found. Filing cabinets fill up. Christmas decorations are only supposed to be up for 3 weeks at the most, and those old desk chairs need to go somewhere until someone replies to your Used Victoria ad. If you are looking for a long term solution for storage space, here’s a tip for you. Call Andrew using the number at the top of the website. Negotiate a full year of storage, and get a month free! It’s as easy as that. Here at Foster’s Moving, we are proud to be a supporter of a fantastic product called the FrogBox. FrogBoxes are durable and convenient, a great idea for any move. Did you know that FrogBox is also committed to the environment? They were even given the Best Green Business Award in 2011 by Small Business BC. It is no secret that cardboard boxes do take a toll on the environment. FrogBoxes are a green alternative. They are constructed of industrial strength plastic that will be reused hundreds of times instead of taking up space at a landfill. FrogBox also drops off and picks up your boxes with their signature bio-fueled trucks. These run on waste stream bio-diesel (made from recycled cooking oil), this is a step up from traditional bio-diesel (which isn’t as environmental as it sounds). One thing we love about FrogBox is its commitment to its amphibian namesake, the frog. FrogBox donates 1% of its revenue to organizations that protect and restore wetlands and other frog habitats. One third of frog species are actually endangered, making them the most threatened vertebrates on Earth. If they continue declining at their current rate, they will go extinct faster than the dinosaurs did. Frogs are an indicator species, this means that they react first to negative changes in their environment. The appearance or disappearance of frogs lets us know how healthy a given ecosystem is. This is important because their wetland homes are crucial not only for the animals they support, but also for filtering our water and protecting us from floods. 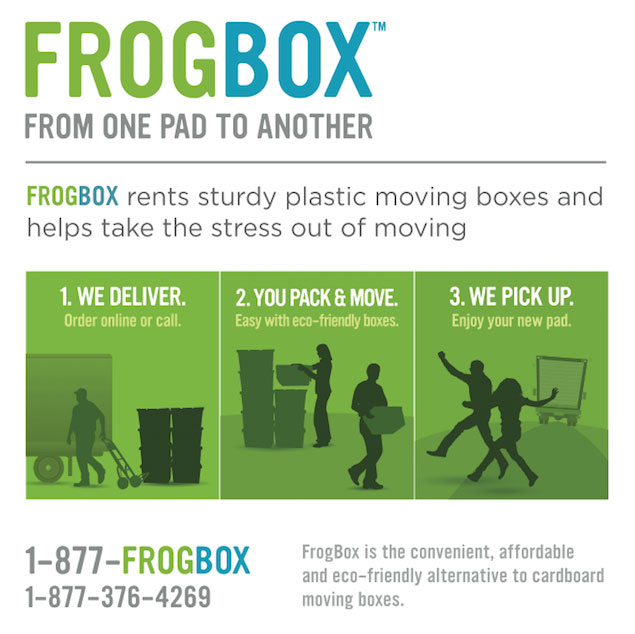 If you are thinking about your carbon footprint, consider FrogBoxes the next time you move. Foster’s Moving is happy to work with them anytime. Foster’s Moving and Storage is based in Victoria on Vancouver Island but our legendary service is well known throughout Western Canada. A Mover with nothing to move, will go stir-crazy! Literally forcing them to satisfy their insatiable desire to “stack-and-pack” with untold hours of Tetris. You Can Help, And Get A Great Deal On Your Move At The Same Time! Are your move dates flexible? If they are, We have the following routes and dates available. And You’ll save 30% for your trouble. Vancouver, Surrey, Abbotsford, Chilliwack, Hope, Merrit, Kamloops, Prince George and Smithers BC. Edmonton AB, Kamloops, Merrit, Hope, Chilliwack, Abbotsford, and Vancouver BC. Please note, you don’t need to be travelling the full route, if you only require a portion of the route that is okay too. You’ll Be Saving $$ And Helping Prevent The Mover’s Most Dreaded Affliction: Tetris Thumb. What a trip! We just returned home from helping a customer make the move from Parksville to Fort St. John this last week. We ferried their belongings across the ocean, climbed over the Rocky Mountains and snaked through the boreal forest. If anyone has ever lived in the more frigid parts of our country, then the picture below might be chillingly familiar. We aren’t used to this sort of thing though, so we were especially careful. As you can see, we didn’t face the best driving conditions. We needed to make sure our customer’s belongings were securely protected from damage, so we padded every inch of her things. We padded her chairs, her tables, some baskets, and even her garbage can. With only half of the truck loaded, we had already used up two stacks of padding. When packing, it is hard to overestimate the importance of wrapping your things well. This is especially the case if the weather will be less than ideal. Leaving Victoria always reminds us of the weather that the rest of the country deals with. Already the beginning of February, and it has really been quite a mild winter for us this year. We haven’t even seen our usual couple days of snow. We aren’t in the clear yet, though. As hard as it is to say, things could still take a turn for the white. So if we do start to see rougher weather and you are planning a move, remember to pack your stuff well. Because we were careful, our customer’s things all arrived without incident. We hope she is settling in and enjoying her new home in Fort St. John! Fosters Is On The Move! We’re hitting the open road this weekend on one of our long distance moving trips to Alberta. 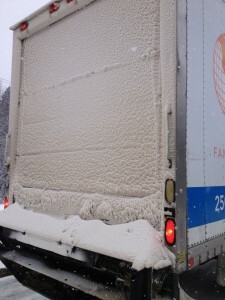 The roads might be slick with winter weather, but our drivers have the experience it takes to make it there safe and sound. We’ll be helping others on their move to Victoria as well, so the whole trip should keep us busy for the next little while. If you have never taken the roads through the Rocky Mountains, it’s really quite beautiful. We’ll do our best to take some pictures on the way. Maybe we can share some good stories with you here when we get back! Just because we’re on the road doesn’t mean we’re out of reach. If you need to get in touch with us, you can always call. Even if all you can do is leave a message, someone will be in touch with you as quickly as possible. Check back here later for pictures of the trip, or you can Like us on Facebook, and we’ll post the pictures there as well. Hope everyone has a great end of the month! © Copyright 2013. Foster's Moving & Storage, All Rights Reserved.